The internal structure of the stem is more complex. Stem is differentiated into nodes and internodes. The leaves are inserted on the nodes. The arrangement of leaves on the ‘nodes has made the stem more complicated. Stem has three fundamental systems. These tissues systems are epidermis or dermal tissues, ground tissues and vascular tissues. In conifers and dicotyledonous plants the vascular tissue system in an internode consists of strands or vascular bundles. They are arranged in a hollow cylinder. It divides the ground tissue into an outer region called the cortex, and an internal region known as the pith. The strips of ground tissues between the adjacent vascular are called medullary rays or pith rays. Medullary rays connect the pith with cortex. The epidermis of the stem consists of a single layer of cells. The walls of these cells are cutinized. This layer is covered externally by a cuticle layer. Stomata are rare in the stem epidermis. The cells of the epidermis are living. They are without any chloroplasts. They show meristematic activity. The meristematic activity increases the surface area of epidermis during primary growth and secondary growth. 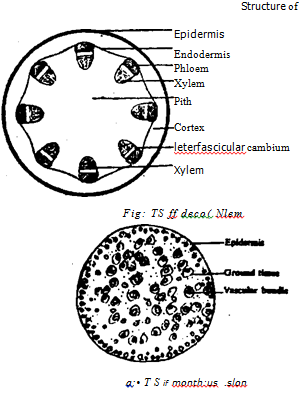 Parenchyma cells: Most pail of cortex of the stem consists of parenchyma cells. These cells often contain ctiloroplasts, especially in the young herbaceous plants. Collenchyma: The outer part of the cortex contains collenchyma cells. They may form a continuous layer. Or they may be grour ed into strands. Sclerenichyma: In certain plants, sclerenchymatous tissues are found in place of collenchyma. They are present in the peripheral layers of the cortex. They act as primary supporting tissue. (a) Collateral: In this case xylem is present towards the inner side and phloem is present towards the outer side of vascular bundle. Amphicribral: In this case, xylem is completely surrounded by phleom. These vessels are fount in fruits, flowers and ovules of certain plants. Amphivasal: In this case. phloem is completely surrounded by xylem. These vessIs are found in certain number of daily Liliaceae. Vascular cambium: A narrow strip of meristematic cells is present between the, xylem and phloem in the vascular bundles of dicots and gymnosperms. This strip of meristematic cells is called vascular –cambium. This cambium becomes active at the start of secondary growth. 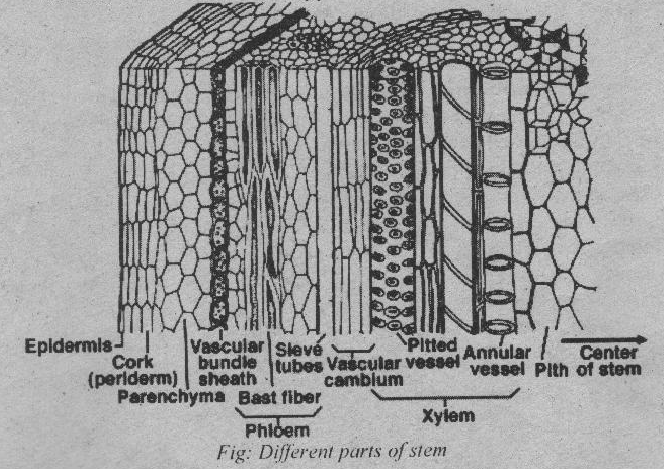 Vascular bundles having cambium between xylem and phloem are called open type. But vascular cambium is not found in the vascular bundles of monocots. Their vascular bundles are closed type. A tissue of variable width is present between the inner most layer of the cortex and outer boundary of the vascular bundles. It is known as the pericycle. 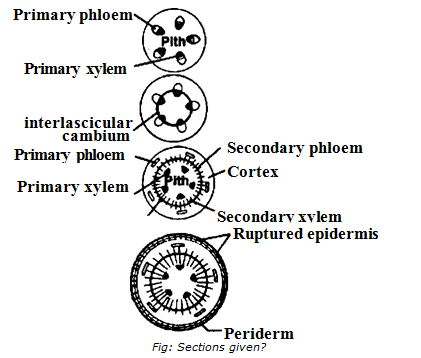 The pericycle is formed of one or more layers of parenchyma cells. 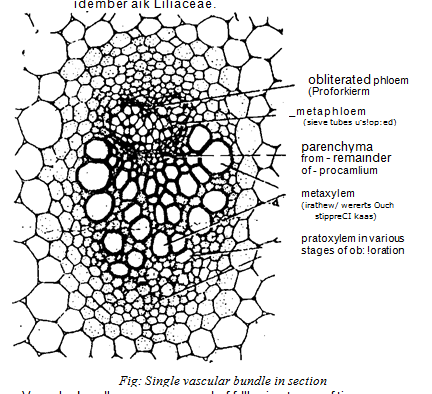 But in most plants the cells of the pericycle just outside the phloem are modified into fibers. These fibers are called perivascular fibers. The pericycle in the region of medullary rays remains parenchymatous. In certain plants, smaller sized vascular bundles are found among the ring of large sized vascular bundles. Sometimes, such bundles are present slightly outside the vascular ring. These bundles supply the leaf. Therefore, they are called leaf traces. Leaf trace moves to the leaf. Therefore, there place is occupied by the parenchyma cells. This space in the vascular cylinder filled with the parenchyma cells is called leaf gap. It is present just inner to the leaf trace. Similar traces also found in young branches. The vascular bundles are irregularly scattered in monocot stem. There is no distinction of cortex and pith. The smaller bundles are present towards the periphery and become gradually larger in size towards the centre. In some plants the vascular bundles may form one or more indistinct rings. These rings have band of sclerenchymatous at the periphery. T he vascular bundle is completely surrounded by a sheath of sclerenehyma. 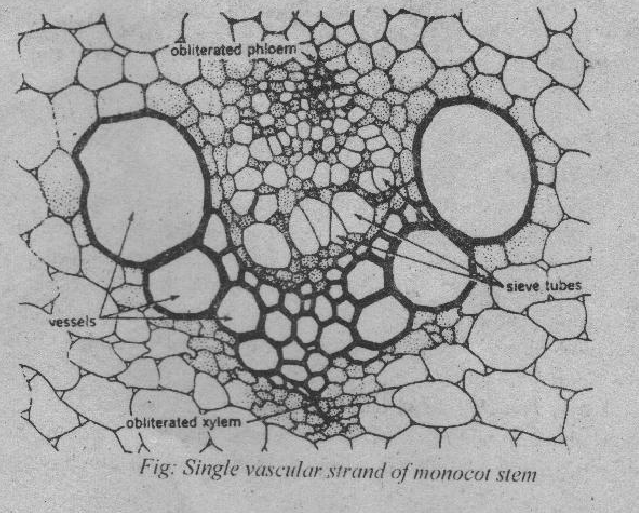 There is no cambium in the vascular bundle of monocots. The ground tissue is mainly composed parenchyma cells. These parenchyma cells may he absent in central region. It makes the stem hollow. The xylem is in the form of a V shined structure. It has narrow protoxylem elements lying at the base if the V and the larger metaxylem elements on the tips of arms of V. The phloem lies almost in between the arms of the V-shaped .Xylem. 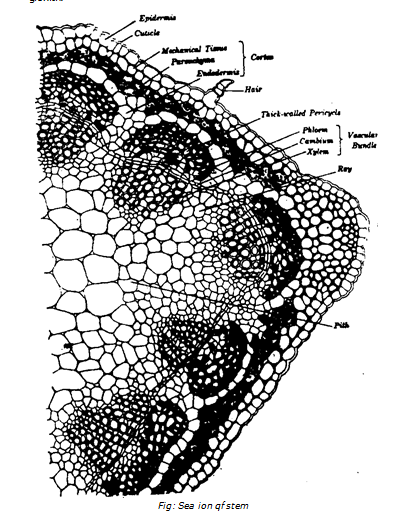 Parenchymatous tissue separates the phloem and xylem elements.